He’s not being a total jerk. Salamandrians DO regrow their limbs. It makes them ideal practical pirates, if harder for them to be stereotypical pirates. THEY ARE SHARP. YOU ARE STUPID. …playing Captain Obvious, are we Skaervs? 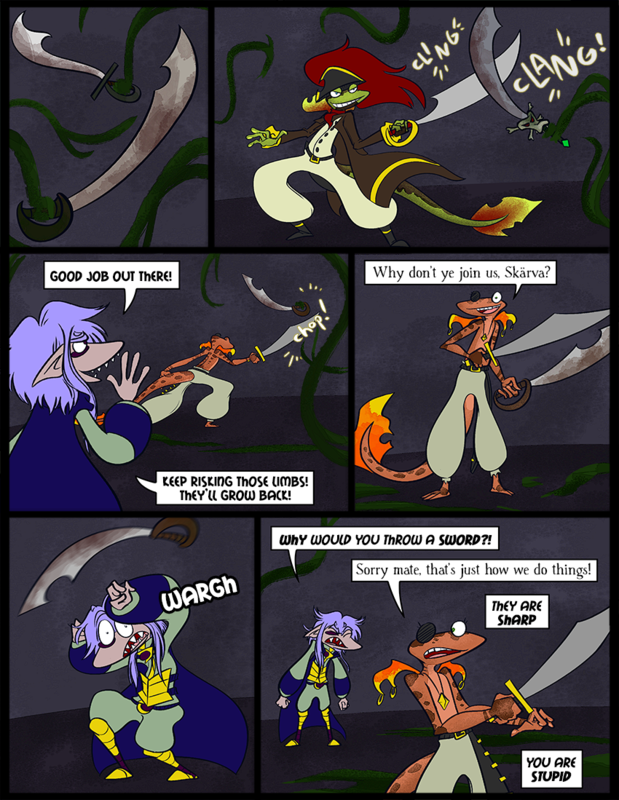 Come on Skarva, I think you could muster up enough magic to stop the blade! You’re just being whiny! Well he IS good at magic, but he’s even better at being whiny. It’s not that hard Skaerva, how well could seaweed possibly hold onto a handle? Skaerva, please. You’re the main antagonist of a popular video-game series. You’ll be fine ’till the next game. 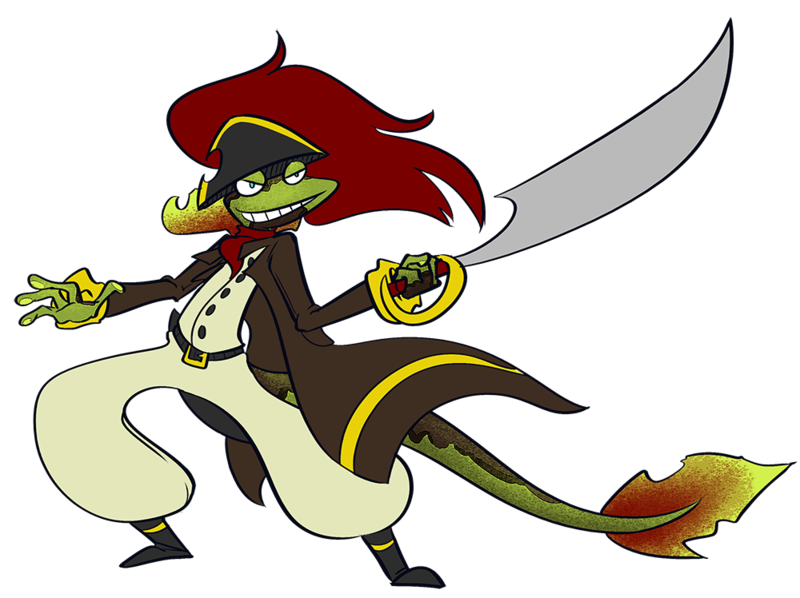 Is that Orange Salamandrian a guy or a girl? I figured it was a girl cause of the eyelashes. She is. You can tell because of the spots too. Males’ secondary color is all connected. I’m writing this in a comment so I remember to fix it later. By sheer coincidence she originally lost her eye to someone passing her a sword during battle, but she always tells anyone who asks about it that is was gouged out from battle with the Navy, and that it definitely wasn’t an accident on her first day. I find this very likely. Yes! Then they just need to get themselves some airships more leather cloths and BAM, steampunk airpirates. That would actually work pretty well concept-wise for the flish. And with a tiny healer who has unlimited power and knowledge somehow, they are an unbeatable army! Also an unlimited food supply. Wait no, Skärva don’t act on my terrible idea! Being able to have all your mana back by eating the pirates you hate would make Lorelei sad! It really all depends on her though, if she doesn’t like the idea of Skärva eating the arms that the Salamandrians lose she’d just stop healing them (which is using their natural regeneration, Lorelei couldn’t grow back a Skärva arm for any new people). Really seems like a win-win for Skärva though. Would it be possible to regrow a Salamandrian from a head with the application of Lorelei healing? I don’t know whether to be impressed or terrified that you devised a sensible in-world modest proposal for magic supply via hacking off and consuming renewable body parts. Of course, as you acknowledge, it wouldn’t be practical in most cases if Lorelei didn’t have the seemingly limitless supply of mana already. But you’re right, she would not be down for this. Um. I think the Salamandrian would be instantly dead at that point, and one thing Lori cannot do is revive the dead.